* Abed Nego Tembeng is an interesting central defender at Astres Douala. Tembeng, formerly of the Cameroon B and Cameroon U-23 national football team, was signed from Aigle Royal before the current season, and has become an established member of the first team. * Goalkeeper André Ebode played regularly for the Cameroon U-17 national football team in 2010 and 2011. Ebode, formerly of Sports Etudes from Yaoundé, has now signed for Astres Douala. * Apparently, Astres Douala is focusing on developing youngsters, often bringing them in from second or third level clubs / amateur clubs. Marius Noubissi is an interesting newcomer, signed from “Ecole de Football Espoir” based in Dschang. Earlier this year, Noubissi was part of the Cameroon U-17 national football team. The youngster has already made his first team debut for Astres Douala. * Christopher Ayissi (born 25.10.1990) is an attacking midfielder who has forced his way into the first team of Canon Yaoundé. Ayissi, formerly of FC Bamenda, was part of the Cameroon U-20 national football team in 2008 and 2009. * Briand Eyong Eko (born 24.01.1992) of Canon Yaoundé is another player signed from FC Bamenda. Eko is a tall, athletic right-winger or striker. * Veteran defender Pierre Wome (born 26.03.1979) of Canon Yaoundé has been a sensation since returning to Cameroon after an eventful career in Europe. Wome, who has played a total of six matches in the FIFA World Cup (1998 and 2002), has scored three goals since joining Canon Yaoundé in March 2012. * Canon Yaoundé has signed promising goalkeeper Domwa Souaressam who has done well for second-level side Santos de Koza. Souaressam is a tall, commanding goalkeeper, most likely born in 1992. The experienced Junior Djoky (born 12.10.1982) is first-choice goalkeeper at Canon Yaoundé and Souaressam could learn a lot from him. * Thierry Makon Nloga (born 09.10.1983), the current top scorer in the MTN Elite One 2012 with 10 goals, is apparently on the radar of Tunisian top club Club Africain. * Jean Landry Bassilekin of Renaissance de Ngoumou scored twice on 22.07.2012 and his total tally is now eight goals in his first ever season at top level of Cameroonian football. Bassilekin is a tall, lanky striker, currently part of the Cameroon U-20 national football team. * Franck Hemmo Simo, the striker of Sable FC, is kind of a mystery man to me. According to footcameroon.com, Hemmo Simo is a former player of the Kadji Sport Academy and Turkish side Mersin Idmanyurdu SK. I know that a player called “Emo Simo”, mostly referred to as “Ghislain Emo” or “Ghislain Aimé Emo”, born 06.08.1988, played for Mersin Idmanyurdu SK in 2009-2010. Apparently, Emo was signed from the Kadji Sport Academy. I am pretty sure that Franck Hemmo Simo and Ghislain Emo is the same player. * Gires Tchamake (born 22.07.1990) of Unisport FC is a player that deserves attention. The consistent right-back is a hard fighter who runs for 90 minutes and an excellent reader of the game. 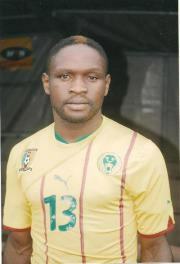 Earlier this season, Tchamake was part of the Cameroon B national football team. The picture is of Tchamake and was found on 45fois2.com. * Watch out for Martin Patrick Yon Loa of Union Douala. The young winger has been a revelation in his first ever season at top level. who are you to tell that hemmo sımo and hemmo ıs the same person that emo. this could be a reason to attack you ın justice for diffamation. iook out when you can not proove what you say. are you civil state admınistrator ?